I love this connection between food and landscape, so obvious and yet I had not quite seen it in this way before. Thinking about what our food teaches us about our landscape…well. I have learned a lot through my short time on smallholdings, through growing up in the desert, but I don’t know enough. It is not just loss of knowledge through city living or supermarkets, I think of Vandana Shiva writing about just how much the proponents of monocropping have actively destroyed. Yet there is so much happening that gives me hope. Like Emigdio Ballon, come from the highlands of Bolivia to Tesuque Pueblo of New Mexico. Working now with the Pueblo to grow fruit trees and beans, and maintaining a seed bank of heirloom crops. Up near Phoenix, along the salt river, they built extensive irrigation systems. Left them. Salmón writes that this is possibly because they became salinized, silted up. Instead of upping the ante, the people returned to a simpler agricultural system, one that was more beneficial to their landscape and more sustainable over the years. Everything is relational and connected. 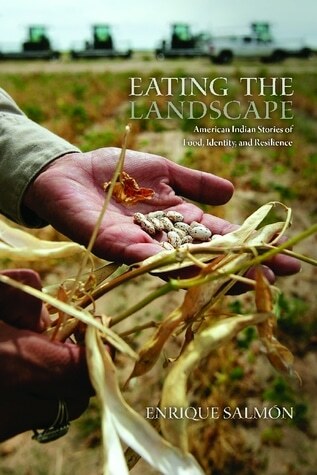 Salmón, Enrique (2012) Eating the Landscape: American Indian Stories of Food, Identity and Resilience. Tucson: University of Arizona Press.